New Design for the main site. I still have a lot to clean up, but it is mostly done. I will make small tweaks throughout the weekend. This design is a lot simpler and cleaner, which I think is a good break from the "squirrely" theme I had before. 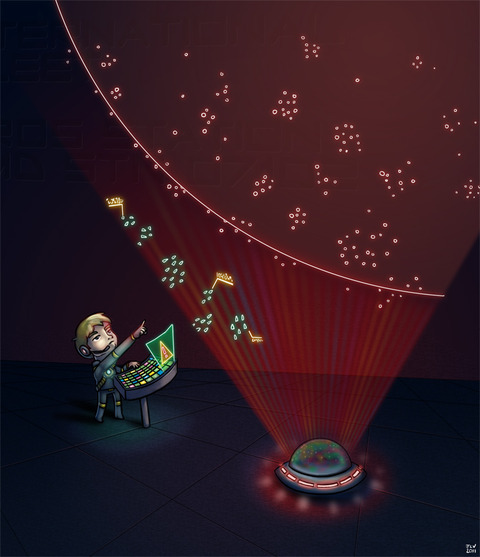 The above "fan art" depicts a very iconic scene from the book Ender's Game. Six hours in photoshop. Once Again I leave backgrounds for hte last, and it shows. But I always imagined this room/scene being very very sparse - just Ender, a holographic console and a terminal. I'm a huge fan of the book Ender's Game. I didn't read it until I was 25, and i was immediately drawn into the visceral action, the intrigue and suspense that culminates in the twist toward the end of the book. If you like sci-fi and are even moderately interested in reading Ender's Game, go read it now. If you don't care about Sci Fi, just quit reading this post since I'm going to nerd out for the rest of it. I just finished Children of the Mind, which is the latest book, chronoligically, taking place 3,000 years after the original book. What's interesting is it took me 5 years to get into the mindset to enjoy the original sequels to Ender's Game, which, starting with Speaker for the Dead, take a decidedly philosophical turn; a definite contrast to the action and intrigue of Ender's Game. For the past six months I've been listening to the entire series via Audible. It made trips to the gym, doing dishes and folding laundry that much more enjoyable. The Ender books are the best produced audio books I've ever listened to, and I really recommend them. It's the next best thing to a movie, with different characters voiced by different narrators (really "actors" is the better term) at times. In addition to the original four Ender books released from 1985-1996, there are five full novels in the Enderverse released in the last 10 years. The took place between the original Ender's game and Speaker for the Dead. I had the ability to read them all in chronological order, so I did. Consult wikipedia if you want to do the same. The last chronological book (the one I just recently finished), Children of the Mind, was a very good read/listen. The plot took a very interesting turn and presents -- and attempts to answer -- interesting questions, such as whether Artificial Intelligence is life, what it is to have a "soul", what happens when you die, etc. That's quite a philosophical arc, going from a little boy in a battle school to a story about the very nature of the universe. The author, Orson Scott Card, has political views that I vehemently disagree with, and he tends to get a little preachy in his storytelling, but I did genuinely enjoy them for their imagination and the very thoroughly realized characters. And for getting through the sluggish parts (some of them tend to drag on with pages and pages of dialog), listening is the way to go. I'm not sure, but I think seeing the story unfold this way (chronoligical rather than the order in which they were written) made it much more enjoyable, and I hope this will especially be true when Card releases the book that ties the Shadow Series and the Ender series together and ties the loose threads. When I finished up Children of the Mind this past weekend, I got inspired to create the art you see above. Sorry for the lack of updates. I have been working (as in the work I get paid for), and in my free time I have been working on a re-release of a very popular ActionSoft game, which I will get paid for at some point in the future. It's one of those extremely overcast, rainy and thundery April days, and I'm using my lunch hour to reach out to you, all 4 of you that subscribe to my RSS. I have been snapping photos at least once a week, so weeks 13 through whatever-week-I'm-on-now will be posted at some point. Ideas for blog posts are more plentiful than the hours I have to post them. I want to do a retrospective of all my old website designs, do some stuff about the game re-release I'm working on, do some more wayback wednesday photo posts, etc., etc. Oh, and a site design is imminent. Mr. Squirrely will be going away. I'm mulling over what to go with, but I'm thinking about combining pixel art with photography somehow. I have not been a faithful blogger, despite still having half of our Japan trip to post about. For that I apologize, and instead of excuses I present you pretty pictures. Our next stop in Japan was Nagoya. Situated pretty much in the middle of the Big Island, Nagoya was only on our radar for one thing, and one thing only: Sumo. Japan has 6 big sumo tournaments a year. A tournament lasts 14 long days, and tickets can be hard to come by, especially to foreigners. The July tournament was in Nagoya. I did a lot of research online to figure out the best way to get tickets, and stumbled upon a service that will buy tickets on your behalf and ship them to the US. I highly recommend them, but be prepared for a bit of sticker shock on the ticket prices. Seeing a Sumo match, let alone a tournament, was on my bucket-list so it was a no-brainer. The Sumo tournament almost fell through when accusations of illegal betting started hitting the news leading up to the month of the tournement. Sumo is serious business. Thankfully the powers-at-be convened and decided to go ahead with the tournament. When we arrived in Nagoya by train, in the late morning, we had a mission: get cash, get to the hotel, and get to the tournement! The tournament day lasts from 8am to about 8pm, and as the day goes on the matches get more and more important, with better and better wrestlers. We wanted to get there by 2pm or so. When we got to the Nagoya station we were tired and sweaty. We needed cash for the Hotel (in Japan you usually pay cash at check in). We looked for the red 〒 symbol which means Post Office, which means international cash machine. Not finding one near the station that we could walk to, and really not feeling like risking it on the subway, we decided to go to the street and hail a cab. We learned that day that Cab Drivers are not nearly as good with English or foreigners as the shop keepers or hotel staff. We did find an ATM, and we did find our hotel, while I nervously watched the map on my iPhone to make sure we were going the right direction. After checking in we navigated the labrynthian Mall/Subway station (a huge underground mall spanning subway station after subway station) and found a train that would take us to Nagoya Castle and the Prefectural Gym where they were hosting the Sumo Tournament. Grateful for some air conditioning and some lunch, we were escorted to our 2-person boxed seat and given a box lunch and a cold green tea. Our seats were closer than the above photo implies. Sumo is a sport of mental intimidation as much as physical power. After the referee/announcer literally sings the names of the contestants, and while fans randomly shout cheers for their favorite team or wrestler, the Sumo wrestlers pose and posture on either side of the center of the ring. They raise their legs and pound them on the ground like hammers. Many times, a wrestler will interrupt the posturing, get up and grab a handful of salt to throw on the ground. This is the first half of the match - the mental intimidation. The goal is to psyche out the other wrestler. Eventually, usually with little warning - the huge behemoths rocket toward each other and collide like two fleshy planets. The goal, if you don't know, is to get the other wreslter out of the circle or on the ground. It doesn't take long. Usually less than 10 seconds. We watched and marveled at the spectacle. We watched geisha tend to old (and apparently) rich patrons, and watched middle aged men who had had too many sapporos stumble down the stadium steps. At about 6pm we wanted to sneak out and go to the nearby castle, which was on our agenda. However, they were closing by the time we made it to the entrance. It was no matter, since we were ready for dinner at this point. This was the first restaurant I had actually researched from home ahead of time, and I was ready. 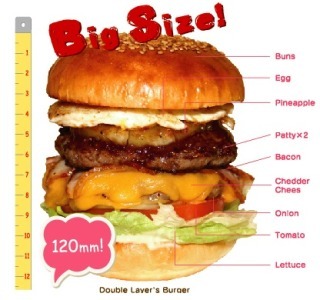 The restaurant was called "Layers", and they specialize in hamburgers. I had read stellar reviews. We took another cab there because it was a bit of a hike from a subway station. I really regret not taking my camera to this place. I mean, extreme regret. Take my word, this place was one of the smallest restaurants ever. A brightly lit beacon on a dark Nagoya street not far from downtown, this place had about 4 tables total, and 2 extremely friendly staff. One the cook, one the waiter. Christina got a hot dog, I got an avocado cheeseburger and we shared a plate of fries. I am not exaggerating when I say it was the best hamburger I had ever had. I'm not just saying that because I had been used to rice and fish or chicken. It was the perfect size, perfect doneness, perfect balance of toppings. We soaked in the kitschiness of the small restaurant while we savored our dinners. We were the only ones in the place, and the waiter stood at attention to let us know he was at our disposal, but he never felt like he was breathing down our necks. When we left the restaurant, I turned and said, in broken Japanese: "Totemo Oishii Desu!" (That is very delicious!") They both grinned and said thank you very much as we left to stroll through downtown back to our hotel. 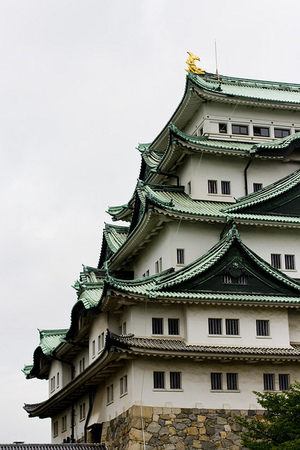 The next morning we had a few hours to kill before we had to catch a train to Tokyo, so we went back to Nagoya castle. The park was beautiful and lush, and we had some awesome ice cream before touring the (reconstructed) castle. Part museum, part reconstruction, the castle was one of the best sight seeing spots we went to in Japan. It showed a slice of life in Feudal Japan and the mythology of Nagoya. It also highlighted the culture of war that ruled Japan during much of this time. Kingdoms that rose and fell in the mountains and shorelines of medieval Japan. Our only thought while heading to the train station and eventually Tokyo was that we should have spent one more day in Nagoya. For all the Nagoya photos, click here! Next, Tokyo in 2 or 3 parts! As promised, here is part-two of the part-two of our trip to Japan: our second day in Kyoto. While things may have ended poorly the night before, we woke up with a new resolve to not let things go badly. It helped that we had a peaceful, quiet night in our Ryokan room, and did a load of laundry on the roof, where we beheld a nice view of the back alleys of downtown (which I regret not taking pictures of!). We awoke early the next morning (and waking early was just a consequence of the jet lag, as was crashing at about 10pm -- and 10pm was about the latest we managed to stay up for the first half of the trip, at least), and got ready to get a "traditional" breakfast, courtesy of the Ryokan. We arrived at about two minutes 'til 8:00am (we requested an 8am breakfast) and at our table was a goregous spread. The host explained all the components, including boiled tofu (which was the best tofu I'd ever had), miso soup, a salad, a small omelette, some fish, some "pickles" (they love their pickled veggies in Japan), rice and a grapefruit. Knowing we had a full morning ahead of us (we planned a trip to a Monkey Park for the morning) we were glad to have a big breakfast. After breakfast we checked out the little garden/courtyard where they had a tiny little shrine. Afterwards, we headed to the main Kyoto subway station, and hopped down to the JR station where we took the JR line bound for the Iwatayama monkey park (well, near the monkey park). It was already shaping up to be a warm day, and the grey blanket of clouds made the whole place a bit of a sauna. The 30 minute train ride was fine, and I knew we had about a mile walk to get to the entrance of the park. But, in Japan, walking is part of the culture and experience, so I figured we would be okay. We passed some rickshaw operators and many vendor stands and ice cream shops on our way (this was clearly a touristy spot). Getting to the entrance wasn't a problem. We paid our 500 Yen each and headed in. Okay, "in" is not the right preposition. I need a preposition more fitting to the geography of the park. When I say "in", I really should say "up", because basically that's the direction of the park. Up. As in, up some steep stairs and inclines. It would not have been that bad if we weren't already a little glisteny from the walk to the entrance. We climbed up two sets of pretty steep stairs, a few hundred yards into the park and finally came upon a sign and a map describing the park. Now, I know I am not a model of physical fitness, but we were both sweating and tired. Seeing that sign, and realizing we were only halfway up the climb was frustrating, to say the least. 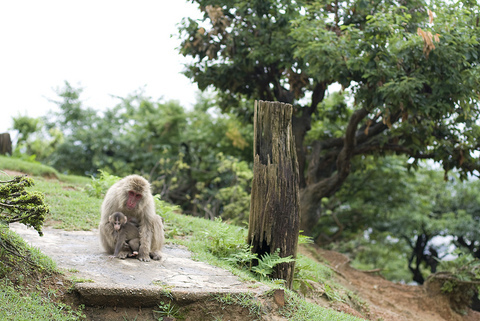 I did capture a monkey or two that was coming down the mountain, the few that were brave enough to come down from the sanctuary to see us. Every sign we saw said "don't look the monkey's in the eye or they will hunt you down and kill you", more or less, so I was sure not to make direct eye contact, or move towards them or make any sudden movements. I wanted to go up since we had gone this far (and what's a little more sweat between spouses? ), but Chrisitina wasn't feeling it. So, I told her what ended up being a fairly damning statement: "If I'm not back in 15 minutes, come up and find me." I went up a path on the left, and had to climb a couple hundred more feet to get to the sanctuary. A sign told me when I was standing as high as Tokyo Tower, which did little to help. Finally, at the top was a plateu, a partially fenced in sanctuary. Monkeys everywhere doing monkey things. I walked to the shed where I was greeted by a woman with a frozen wet nap (apparently sweat is a problem they have dealt with before). Inside you could buy treats and feed the monkeys from behind a metal barrier. To cut a long story short, I had to climb down a path I didn't even know existed on my way back, and I ended up burning through more than 15 minutes, and by the time I found the benches again, Christina was gone. Did she decide to go down? Did she climb up to find me? I obviously should have never said "come and get me", but I knew I was trapped. If I went back up, she might be coming back down the path I just took, and we'd miss each other again. Without a 2nd phone, there was no way I could tell her I was waiting for her. After finding a couple of english-speaking people making their way up to the park, I asked them to convey a message if they found Christina so she'd know I was waiting. If I had known the climb up would have taken more than 15 minutes *and* that the climb down was on a completely different path, I would have come up with a better plan. Needless to say we longed to be back at the hotel -- again -- and a nice cool shower. We did manage to eat at a nice place at the subway station on the way back, where Christina got some Maguro (raw tuna) rice dish and I got some awesome Soba noodles. That afternoon we were signed up for some classes at WAK Japan -- a volunteer cultural organization that gives classes in everything from Sake tasting to origami. One of Christina's bucket-list Japan things was a Tea ceremony, so we signed up for 3 classes: a Tea Ceremony, Calligraphy and Origami. Luckily the WAK center was a few blocks from our hotel, so we were able to take a quick shower and walk over there in plenty of time for our classes. They held our classes in a small traditional-style house (we had to take our shoes off! ), and our instructor was incredibly sweet. It was the polar opposite of Monkey Park, very relaxing. Definitely the highlight of Kyoto. We learned about the history of Tea in Japan, and how the tea ceremony was created some 500 years ago and how, even today, its traditions are still practiced with a lot of seriousness and elegance. We tried Matcha, which is pulverized tea leaf powder, and even got to prepare some Matcha for each other. It was a very zen experience. Afterwards, we headed upstairs to learn Caligraphy. In Japanese there are three main "alphabets" or character-sets that they write in: hiragana, katakana and Kanji. Kanji literally means "Chinese Characters" and comprises the 2000+ characters that the Japanese imported from China. When I took Japanese in College I could write a handful of the simplest Kanji characters, but some Kanji characters have 20 or more strokes! We learned how to hold a caligraphy brush, how to make basic strokes, and we got to practice a few characters. It was a lot of fun. In the end we ended with a few "works of art" that we will eventually frame, and Christina will never forget the symbol for "Dog". Our last session was origami. We made flapping cranes, a samurai helmet, a frog, and lots of other things. I'm blown away at what people were able to figure out to do with paper. Our 3 hours at WAK were very relaxing and worth every penny. But, our tummies were growling and we were ready -- nay, determined -- to get some Sushi! We did some research back at our hotel (we got wireless to work!). We found a Kaiten-Zushi place (conveyor belt sushi) that was within walking distance of our hotel. This time we cross referenced the address with the map, and made sure. We headed out for our walk, and it was sprinkling. What we didn't know the night before -- what I would have loved to have known -- was that, just a couple blocks east of our hotel was a large street, Kawaramachi Dori. This main drag had shops and restaurants in spades. We were literally 3 blocks west the night before, starving and frustrated at the lack of food! It just goes to show you, no matter how confident you are, know exactly where restaurants are going to be before heading out. We found the Sushi place, and were greeted by the salutations from the staff and chefs. This was the purist of a conveyor belt sushi restaurant: Just a bunch of stools seated around a oval-shaped bar. In the middle of the oval were a couple of sushi chefs, and along the inside of the oval was a choo-choo-train of sushi goodness. 4 or 5 of each sushi offering, one after another. 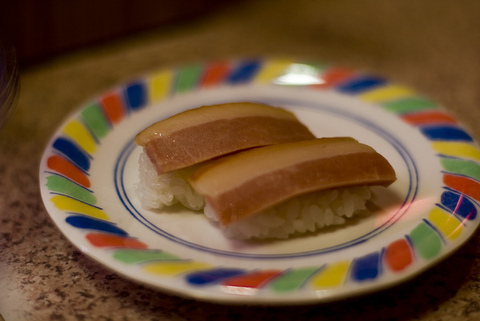 I could make out words like Maguro or Unagi -- even Bacon sushi! It was a sight for sore eyes (or a taste for empty stomachs)! The best part was, every plate was about 130 yen (about $1.50). Christina and I put down about 10 plates between us, and walked out of that place for about $15. No tipping, and taxes are included. It was glorious. The light was fading, and we still wanted to see some shrines and temples since this was our last night in Kyoto before taking off early for Nagoya. We took off and walked east over a river. 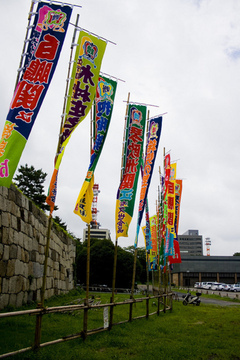 We were just a few blocks from a large park containing about a half-dozen shrines and temples. However, weather (and the quickly sinking sun) were not on our side. We saw a parking lot full of all these white and blue bikes, all locked up and numbered, hooked up to this little kiosk. It was an automated bike rental! It cost us $2 for a bike for an hour, so we decided to go for it! I had a blast zooming down Kyoto streets through the drizzle, making out street signs and finding our way to the park. We did finally find it, and just about all the sun had faded from the sky, and what sun was left was blotted out by dark clouds. It didn't matter. We were there! Well, that part sucked. We couldn't leave our bikes on the sidewalk, and didn't have a way to secure them really. Besides, it was too dark to see anything, and on top of it all off, it started raining, hard! Christina and I straddled our bikes and took them under a big tree while I tried hard to keep my camera bag dry while we waited out the rain. It only took 5 minutes until the rain subsided, and we just took our bikes back up the way we came. It was a side of Kyoto I didn't expect to see, from the seat of a rental bike. In a way, doing something spontaneous like renting bikes and riding them in the rain, trying to race the sun was romantic, in the sense that feeling safe enough to take those risks with someone you care about is, in my mind, the definition of happiness. Sure, it could have gone "better", but in the end it's about who you are with. All in all it was a good evening, even though if I had to do it over again I would have stayed an extra day in Kyoto just for the temples. Suffice it to say we slept very well that night, and we were looking forward to seeing some actual, real life Sumo in Nagoya! All about that (and the best hamburger I ever ate) in my next blog post: Nagoya. 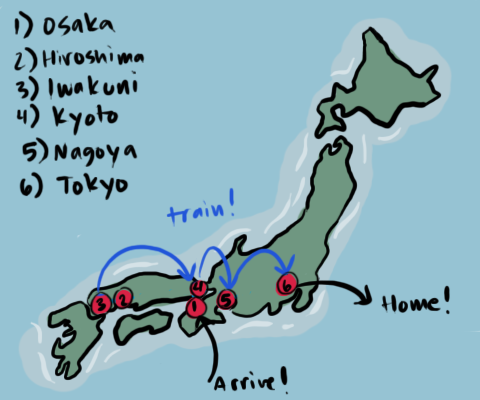 It feels like forever ago we got back from Japan, and I still have 3 more cities to blog about! Holy cow, I need to get this show on the road. Okay, this is a long blog post, warning you now. John dropped us off at the Iwakuni Shinkansen station on the morning of our 2nd full day in Japan. It was an exceedingly un-busy station, tucked away in the wooded hills of Iwakuni. Christina and I were high off our first day in Japan and excited to experience it on our own -- and eat some real Japanese food! The train ride to Kyoto -- for about 90% of it -- was basically the same trip we took from Osaka to Iwakuni just 2 days before, but in reverse. It was a very pleasant train ride, as all of our shinksen experiences were, really. We were staying at the Nishiyama Ryokan in downtown Kyoto. It was literally blocks from the Kyoto City hall, and -- we hoped -- convenient to everything we wanted to do in Kyoto. Thank goodness John had an english map of Kyoto, it actually ended up being a lifesaver! It listed the subway routes and the major sites. Arriving at the Kyoto Station, we dragged our luggage out into the sea of people and bought a day pass for the subway system. Our stop was just two stations away, andwhen we went out onto the street level it was already starting to drizzle. We set out to find Nishiyama Ryokan. Something particularly true about Kyoto, and probably generally true in any old city: the major streets are clearly labeled and easy to find, but as soon as you go into the side streets or alleyways, you are on your own, and if you can't read the signs, you are out of luck. Our Ryokan was clearly marked on our paper map, and we found it on our iPhone, but we could not find it in meatspace. We walked up and down every side street and alley thinking "this has to be it," but didn't see it. It was hot, and muggy, and we were dragging luggage through damp alleys. It was frustrating. Finally someone approached us and offered to help, since we obviously looked lost. They helped us get ever closer, and it seemed like a miracle when we finally looked up and saw the giant "Nishiyama Ryokan" sign, in plain English. The air conditioning and friendly staff -- the manager and his trainee -- were a relief, literally. I awkwardly started taking off my shoes when they said "no, no need to take off your shoes here." Basically, the take-off-your-shoes-everywhere thing just isn't as prevelant as we thought. We paid cash up front for our two nights including breakfast, and were shown to our tiny tatami-mat room. our room had a tiny entryway where you're supposed to take off your shoes (aha! I knew it! ), and then a small raised area with hard wood with a bathroom sink, and to the side, a modular plastic bathroom just like the hotel in Iwakuni. A traditional sliding door lead into the main room, a traditional room of 6 (or 8, I forget) tatami mats, a low table, a closet to the side and two mats on the floor instead of beds. It was mid-afternoon and there was hot water, teabags and some small cookies waiting for us. Christina and I toasted our first night in Kyoto with some green tea, and started dreaming of the sushi and ramen in our futures. We gave the front desk our room key (it was their policy) as we left the Ryokan in search of some fun and food. I figured we were in the heart of downtown, there had to be food EVERYWHERE. We punched in "sushi" in the iPhone map application, and exactly two red pins fell down onto the map. Okay, I thought, that's weird, but let's go! On our way to the first red pin, we went through some indoor/outdoor shopping malls. It was block after block of tiny shops, interesting grocery and produce vendors (but no sushi!) and basic tourist shops. The pin getting every closer, we got hungrier. However, as the kids say, "The Pin is a Lie." There was no sushi under that red pin. Just like there was no Ryokan under the red pin earlier. Oh no! We looked while I tried to find the hiragana characters for "su shi" (I wish I had known the Kanji for Sushi), and nothing around us looked like a restaurant. In fact, we didn't pass a single restaurant on our whole way down (probably a 30 minute walk). Somone came to our aid (again), and we showed them the pin, said "Sushi," and they seemed very surprised. After a few minutes, they pulled over an older Japanese woman, and they said something at about a thousand words a minute, and they finally came to the conclusion that *that* (they motioned at a small sign above a narrow staircase that was covered by a curtain that acted as a makeshift door) was where the Sushi awaited us. Okay, cool! I thought, some real hole-in-the-wall place, I can't wait! We walked up the stairs, peeling back the curtain. It was dark, and quiet. Christina was brave enough to actually open a door and peak in, only to see a woman doing dishes. No mystical chefs making magic out of seafood, just emptiness. No problem, I thought. There's *another* pin! We go to the 2nd red pin, and we find nothing. At this time we were both frustrated, hungry, tired and sweaty. The humidity really accelerated the crankiness. Okay, let's head back, I thought, and we'll go up this way, which is sure to have restaurants. Even the golden arches that showed up on the iPhone was a hoax. That was the last straw. After about 2 hours of wandering "downtown", we didn't find anything to eat and it was getting dark. Dejected, we took a $10 taxi back to our hotel, and I went down to the AM/PM on the corner and bought some snacks like bread and prosciutto. We snacked in our robes, wondering what went wrong, and I seriously wondered what we had gotten ourselves into. Kyoto did not give us a good first impression. BUT! The next day in Kyoto ended on a much happier note, even though day two in Kyoto is still bookended by some frustration. However, I have gone on too long already, and I will have to make day two in Kyoto a separate blog post. It will be full of monkeys, origami, and bacon sushi! And, we learn where all the damn restaurants were hiding. Stay tuned. We've been back in the States a full week, and I still haven't gone through my photos. I've decided to dump the best pictures as I process them to my flickr stream, so please check that out for all the photos. I will post a slideshow of each day as I complete them to this blog, as well as facebook. After a 4 hour flight, a 2 hour layover, and a 12 hour flight (all of which took place over 33 hours on the clock -- we left Chicago 6am on Friday, and didn't arrive in Osaka until 3pm Saturday), we arrived in Osaka excited and a little anxious. Our final destination will still 3 hours by train away, where Christina's step-brother and his family were waiting for us. We got a JR Pass in anticipation of our trip, and I can't recommend them emphatically enough, if you're doing any kind of serious travelling within Japan. They must be bought in the US from a travel agent, and you turn them in to have free access to all but the fastest JR trains and metro lines in the major cities. After going through immigration and customs, we turned in our vouchers for our Rail Passes, and we got tickets to our final destination, Iwakuni. The train ride from Osaka to Hiroshima (about 2 hours) was magical. We got 1st class JR Passes (which I recommend if you have the extra budget), which gave us reserved seats on 1st class cars. We were literally the only people in the train car on the way to Hiroshima, so we just soaked in the countryside. Everything was so green and lush. It was overcast and beautiful from the air-conditioned train. We found out later how hot and humid it really was outside! At Hiroshima, we had to transfer to a local line that took us to Iwakuni (about a 40 minute ride). The local train was more akin to a subway, we had to stand and straddle our bags while surrounded by commuters. I don't have pictures from the day of our arrival at all. I'll blame jet lag and just be preocuppied by it all. John and Brenda met us at the Iwakuni station and walked us to our hotel, then took us to dinner at a Teppanyaki restaurant, where you cook your own meat over a small charcoal hibachi in your table. Christina made the first faux-pas of the trip and barged into the dining room with her shoes on! Luckily the waiter got her attention before she got too far. Christina was in for another culture shock when she pointed at some good-looking meat on the Menu and found out it was actually Horse meat prepared "shabu shabu" (sliced extremely thin and boiled quickly in broth at the table). Needless to say we weren't interested in any horse meat. After dinner Jet-lag started to sink in (it was about 10pm), so we went back to our hotel, watched some TV, and crashed. We stayed at the Green Rich hotel, which was quite nice and very modern, but our room was tiny. Christina posing with her umbrella in Iwakuni. The next day we both woke up dead awake at 6am and couldn't go back to sleep, so we decided to go explore the area around our Hotel, even though it was a little drizzly. I shot some pictures and was absolutely struck by how clean and tidy and safe it all felt, considering how small and rural the town was. Dozens of bikes without locks, people opening their shops and sweeping the sidewalks. After a couple of hours, we met John and he took us on base for breakfast/lunch with his Family. After that, we made a trip to the Kintai Bridge and Iwakuni Castle. It was very warm and humid that day, so needless to say we were sweating most of the afternoon. Kintai bridge was pretty amazing, even though I was disappointed to learn they rebuild it every 40 years (I thought it was original). After crossing the bridge (which cost about $3), we explored a pretty large park with gardens, koi ponds, shrines and other cool things. There was a tram that went up to the top of a steep hill where Iwakuni Castle waited. While Iwakuni Castle was a "small" castle by Japan standards, it was very cool to see, and the inside was decked out with old Samurai armor, swords, and scrolls and paintings. At the top was an observatory where you got a breathtaking view of the whole city, looking south all the way to the ocean. All in all it was a good first full day in Japan. Getting to spend it with family made the transition a lot easier, and it made us excited for the days to come. I'm very glad we saw the Bridge and Castle in Iwakuni. Up next, I will talk about our trip to Kyoto, where our vacation took a bit of a turn for the worse (but don't worry it gets better). Christina and I are less than a month away from our trip to the Land of the Rising Sun. Before, I talked about our trip through the country which will take most of our 10 days. However, our last part of the trip will be 4 days in Tokyo. Tokyo is not a city so much as a metropolis. IN Japan, Tokyo is one of the 47 prefectures or geographical and political "zones" throughout the country (kind of like States, I guess?). Within the Tokyo Prefecture is the metropolis commonly called "Tokyo", even though it technically is 23 seperate Wards which are cities with their own governments, as well as 39 municipalities -- all with a combined population of 35 million people. That's the population of the LA and New York metropolises combined. ... so, you can understand it's a little intimidating trying to plan 4 days there. More about where we plan to stay and what we are doing later. Next Month, Christina and I are taking by far the biggest trip we have in our 5 year marriage (and our lives). We're going to Japan. We had originally planned to go on a Japanese tour with my brother, sister-in-law and nephew, but they had to bail for financial reasons. Christina and I had already commited to saving for the trip, so we figured, "what the hell?" and planned to take the plunge on our own. 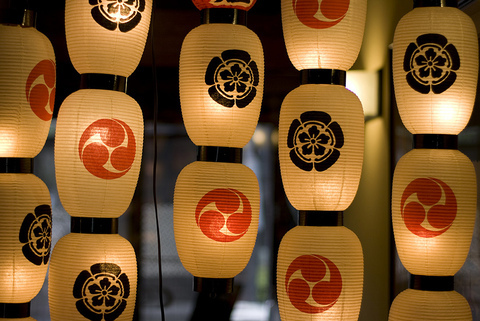 I have always wanted to go to Japan, and even studied Japanese in college. I wish I had kept up with my Japanese, because 95% of it is gone. I know some basic sentence structures and can fumble my way around Katakana and Hiragana, but I've been trying to play catch up these past few months with audio books, iPhone apps, anything to try and get some key phrases to stick. We are planning a 10 day trip, and will be hitting just about the breadth of the southern portion of Honshu (the big crescent shaped island in the middle). Another very good reason for our trip is to visit Christina's step-brother and his family, who are stationed at the Iwakuni Marine base on the very western edge of Honshu. Christina is a planner and we're both worriers, so we put our computer science and project management hats on to plan out a nation-spanning trip over 10 days. We knew we wanted to go to Kyoto, to see a Sumo match, and of course Tokyo and Iwakuni. The best and cheapest flight for us will have us leaving early morning Friday and arriving in Osaka late afternoon Saturday. Unfortunately there aren't any big commercial airports west of Osaka, so that is the closest we can land before heading to Iwakuni. Flying into Hiroshima would have cost an extra $1000 or more, and we are sticking to a budget! So, we'll hit the ground and immediately hop on a train for Iwakuni, arriving about 8:30pm local time. Christina's step-brother John has graciously agreed to meet us at the train station in Iwakuni and take us to dinner. It'll be great to see a friendly face in such a foreign land. Iwakuni is the first leg in our trep from West to East across Japan. It is a long distance, but the shinkansen and Japan Rail (JR) trains are very efficient. The above map gives you some idea of the distance we'll be traveling. From end to end it'll be like going from Champaign, IL to Pittsburgh, PA.
Iwakuni is a great city to visit, turns out. It is "in the country" and doesn't get a lot of tourists, and it has the feel of "old Japan", so I'm excited, even though it'll be much harder to find people who can speak English. Two days later we will take the train to Kyoto, where we will spend the next two nights in a nice, romantic Ryokan, which is a Japanese style Inn, usually with hot springs, communal baths, and tea ceremonies. We're going on a Geisha tour and checking out a tea ceremony and of course taking lots of pictures of the Temples. Next, we take a one-day excursion to Nagoya to see the Sumo Tournament! Sumo Tournaments are serious business in Japan, and every other month a different city hosts a 2 week tournament. In July, it is Nagoya, which happens to be smack-in-the-middle of our trek East. Tickets are pricey, but it'll be worth it. The next day we head out to Tokyo, the biggest Metropolis in the world. I used to think of Tokyo as a large city, but it's actually 13 wards, 24 cities and several villages all tangled into a giant web of concrete and neon lights. We are spending 4 nights in Tokyo, and planning for Tokyo has been just as complicated as planning the whole other half of the trip. Mapping out subway routes, finding a hotel and finding the best restaurants. Tokyo literally has some of the best shopping, best food, best museums and entertainment in the world, so we want to make sure we don't miss out. 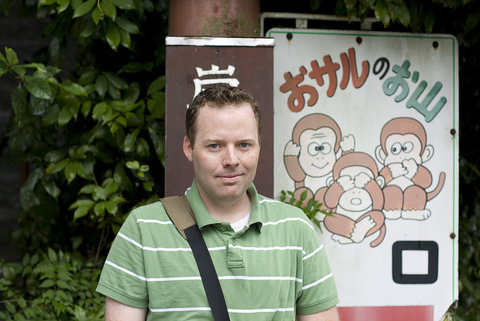 Since Tokyo is such a big part of our trip, I'll be making a separate blog post just about it. I'm going to re-tool this site a bit and post more in-depth about photography and design. What can I say, the spring sunshine has inspired me! I want to go out and shoot at least 2 times a week, hopefully 100 shots per session. As a birthday present to myself, I bought a new lens. It's a Canon 50mm f/1.4. It's a prime lens with a wide aperture, and I got it particularly for the wide aperture, for shooting indoors, and for the narrow Depth of Focus and "Bokeh" effects that are possible at wide apertures. Taking it for a spin. I've been shooting with this lens for over a week, and every time I use it, I find new ways to exploit it to make good shoots. A lot of times, especially indoors, I shoot manual-mode, so I have full control over the aperture and shutter speed. It's more tedious, but it's been the way I've gotten consistenly-exposed shots indoors. Of course, I realize all the shots I'm posting today are outdoor shots. Here is a closeup of some tree bark, showing off the very narrow Depth of Focus. I love exploring textures in closeups, and while the 50mm is not a Macro lens, the DoF effects really show when shooting as close as the lens is capable (about 12 inches). This is probably my favorite shot so far. Since the arrival of Spring, the light at dusk has been amazing, even more so when they create a halo effect around the plants, like so. And it really wouldn't be a photo-post without my favorite subject, Thor. I love the colors and the blurred-out background. 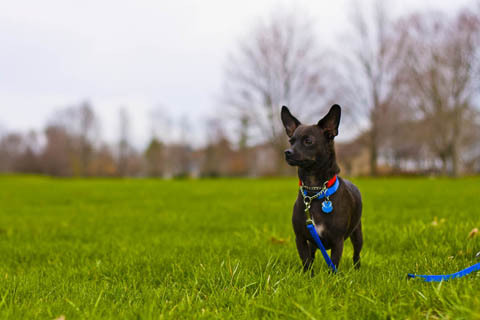 I just barely missed Thor in the DoF, so he is not as tack-sharp as the grass by his feet. Still, I like this shot quite a bit. I don't think the new lens has changed how I shoot, but I think it's allowed me to shoot the way I've been wanting to with my other lenses. I have a very good Image Stabilized zoom lens for a lot of my outdoor shooting, but when I need to shoot indoors, or when I shoot portraits, I will be using my 50mm for sure. 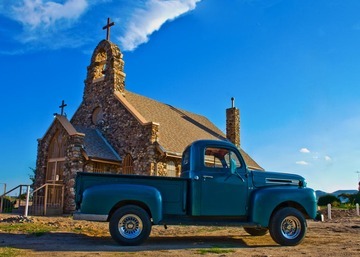 When I was in New Mexico, my Father-in-Law asked me to take a picture of his old Ford Pickup. He's proud of that thing, and wanted something to display on his wall. Now, I don't take those kinds of requests lightly. I wanted to give him the best shot I could. I'm not a very confident photographer at all, but I know I wanted to give the Truck a suitable setting, and I wanted some killer lighting. A few miles down a rural road from their house, there's this old Catholic church. I thought it was a good thing to park the truck in front of for the shot. I suggested about 6:30 pm, hoping to catch the "Golden Hour", when the low sun produces an almost heavenly golden glow on everything. When we got there, I realized I made a rookie mistake. The front of the church faces the East, so at 6:30 pm the sun is basically behind the church. I had to shoot toward the sun, more or less. Not only that, but my Father-in-Law didn't exactly appreciate the "process" of making a good shot. I was knealing, studying the composition, frantically dialing in different settings on my camera. After about 2 minutes, he says "well, you think you have enough shots?" "WHAT?" I hadn't even really taken a shot. Everything I took was blowing out the church too brightly and basically making the truck a silhouette. So, I settled for a good composition (not exactly easy with the spot I chose), and took as many different exposures as I could, hoping to salvage it once I got back. This shot is passable. The truck may be correctly exposed, but the church is overexposed. The colors are a little washed out (this seems to be par for most RAW images without processing). Not to mention the unfortunate powerlines and flagpole in the shot. But, it's what I had. TThis single step is only possible because the image was taken in RAW. So much image data is thrown away by the camera if you shoot in JPEG. With Adobe RAW you can adjust dozens of different things, basically peeling back layers, bringing out the data that you want for your image. At this point, nothing in this picture is anything that wasn't captured by the camera. My next goal was to get rid of the powerlines and flagpole. Since They were mostly overlapping the sky, it was pretty easy to get rid of them. Just a lot of healing brush and clone tool. At this point it's looking about where I want it, but I took a few more minutes, playing with levels, contrast, saturation, etc. I wanted to desaturate the sky and church a tad and put a warm filter over everything to give it a little "old school" feel. This is the final shot. I'm going to print it out and have it frame, as a present for my Father-in-Law. I hope he likes it! This just goes to show you how much of a great image relies on what you do after the camera has captured the data. The RAW image from the camera is just that: raw. It's up to you to figure out what story you want your image to tell. I used the Blog Import feature in Squarespace to import all my posts from my Blogger site. Worked like a charm! I didn't want to keep all of them, so I moved over the ones I wanted to keep. Feels good to have a nice backlog of posts on this blog again, like I've already got some momentum. This is my first Squarespace-hosted blog entry. Just giving this site a quick spin. Took me a while to get my custom CSS to work within Squarespace's interface, but with some tweaking and minimal head-on-desk moments, I got it to work. It's definitely still trial and error for me. I'm liking it so far. Soon I hope to have a blog full of photos, drawings, tales of programming horror and other things of mystery! Photo of a crane I took this past May.